Learn to surf with Planet Surf – the best choice for your surf holidays. Learn to surf kitesurfing, windsurfing, wavesurfing or just surfing?. So many definitions and kind of sports – no wonder that more and more misunderstandings come up. For every individual is it as plain as the nose on your face: ´´I am a surfer!´´, The Windsurfer takes the definition because he has a board and a sail to use the wind and slide through the sea. Also the wavesurfer describes himself as a surfer, he has just a board and use it to take the waves to the beach. But for sure, windsurfing and wavesurfing are not comparable. They are two complete different kind of sports. If you learn to surf wavesurfing, you wear a wetsuit which is not just protecting the surfer for coldness, but also protects him for the sun and abrasions. In the same manner, the wetsuit makes it a lot of easier to swim, because it ensures you to have buoyancy on the water. Every board has three fins. The size of the board depends on the quality of the surfer. You start with a large board which is called ´´longboard´´ and depending on your level, the board is smaller, lighter and have less buoyancy (´´shortboards´´). For wavesurfing the wind is not necessary, because the surfers need in the power of the wave to get drive and speed with paddling. If the wave touched the board, the surfer stands up (“Take off”) and steers the board with speed and weight shifting to drive the wave down. In contrast to windsurfing: here the speed comes only from the power of the wind. The strenght of the wind decides about the size of the sail. The weaker the wind is, the larger is the sail. Also important is the wind direction which is more or less decisive for the direction of riding. The windsurfer is able to decide about his desired direction of riding with the sail position, turning the board or crossing directions. 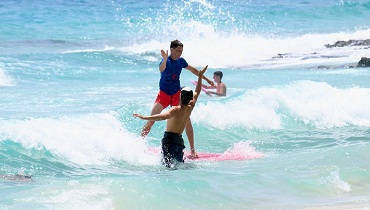 We are just interested about the first: Learn to surf wavesurfing- and for that we use the word surfing. The fastest way to learn it right and with a lot of fun, is with a surfcourse. In surfschools or surfcamps all over the world you can learn the most important basics to improve yourself constantly by professional support. Surfing is for everyone, and those trips are also for single travelers – in surfcamps you will find contemporaries very fast. But likewise more and more families prefer to travel at the beach (also in the winter), to try out this sport with their children. Learn to surf with the whole family! In a surfcourse you do not just learn general sequences of movement which are important for the further course, you also get valuable information in theoretical lessons: equipment, operation and rules about the risks. Our surfcoaches who have licenses and a pedagogical know-how, will teach you the basics with a lot of fun and try to bring you up ´´on board´´ as fast as possible, so that you are able to surf the first ´´green waves´´ very soon. Learn to surf with Planet Surfcamps – the best and most professional way!